It’s not hard to prefer old Benzes to new Benzes. The Mercedes-Benz lineup of the latter part of the 20th century was Mercedes-Benz done right. With bulletproof reliability, tank-like quality, and luxury fit for a king...or rather a kaiser...it’s easy to understand why. You can find millions of people everywhere waxing poetic about the W126, W124, R107, and W201, all wonderful cars that sparked legend in every single corner of the globe. Myself, however, I prefer the Mercedes-Benz in the 1990s. To some, the 1990s is the time when Mercedes began to lose its way. Legendary chassis such as the W126 and W201 were all being replaced, and the new models were introducing unnecessarily complicated electronics systems, trying to pave their way into the future. To me, however, the 1990s were a crossroads, the last of the finest. They may be troublesome, but they were the last bastion of old-fashioned Mercedes quality. That’s why the R129 is probably my favorite Mercedes-Benz model of all time. Last time I showcased a 1:18, I regaled how much I loved the much-maligned Porsche 996, but this time, I know I’m not alone in the love for this luxurious grand tourer, a testament to old-school 1990s cool. In fact, that post, and a video from some YouTube fella named Tyler Hoover, inspired me to seek out a R129 for my next 1:18, continuing the small-scale dream car venture that started with my 1:24 Alfa Romeo Giulia last year. On the used market, there are many 1:18 R129s to choose from. Spreading from manufacturers such as Revell all the way up to the giants from AutoArt, you pay for what you get for. I decided to go for the middle ground as always, and go for Maisto. I received this Maisto SL500 new, in box, from eBay for just under $30. 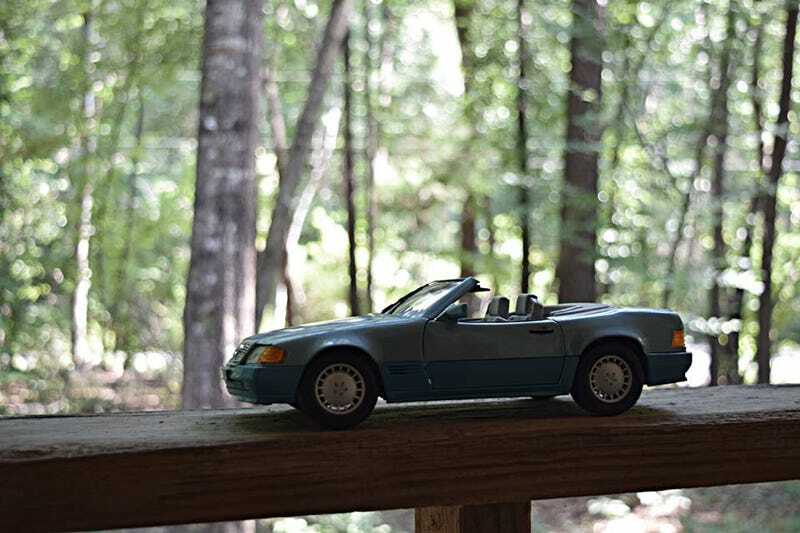 When it arrived, I realized that I had been graced with what I believe to be the perfect example of a 1:18 SL500, although it may not look like it, because just like the car it represents, it also showcases just how detailed and solid old Maisto once was. Okay, maybe the detailed part is a bit of a stretch in some areas, but there are some really neat features to this old car, certainly ones you can’t find on modern Maistos, even including my aforementioned 996. First and foremost, every single opening works, from the hood to the trunk. Up front you can find that glorious M119 V8 recreated in all its 1:18 glory. Like most old-school Maistos, this engine cast is a full cast, not just some plastic overlay for the engine bay, which is just so neat. In the trunk, you find a full spare tire, which is basically just a copied version of the regular tires fastened to the liner. My favorite exterior detail, though, has to be the rollbar, which pops up, and makes photos look really cool sometimes. The interior is actually really impressive, detailing wise. Of course it has the obvious tell-tale sign of Maisto, being the oversized gear stick, but everything else is done nearly right. The wood looks lifelike, with detailed painted burling and swirling, making it look a little bit more than just some brown paint. There’s a sticker for the gauge cluster that shows off some system check lights. The radio and other electronics have decent paint applications, making them all the more lifelike. If it wasn’t for the all-black steering wheel and that behemoth of a gearstick, at the right angles, you might just be able to fool someone into thinking it’s the real element. I also love the little details of seat belts and sunvisors, all the little extra bits count. You can see already that I love this interior. Overall, this model may not be as detailed as some of the high dollar units, but I really love it. It’s built well and holds its own when it comes to standing out in its funky teal-blue color. A much beloved addition to my collection for sure, and I would love to get my hands on more old-school Maistos in the future. Until then, this SL500 sits proud next to my 996 and others in my collection. And, did I mention, I’ve already gotten it a friend. More to come on that later, though.